Web design and maintainance services are available ranging from single page sites through to those with several hundreds of pages, such as the Archaeological Planning Consultancy site. Sites can be designed according to strict rules regarding accessibility legislation and schemas laid down by the world wide web consortium (W3C), or more fluidly, employing multimedia such as QuickTime, Flash or Scalable Vector Graphics (SVG). We also offer database driven site design using MySQL & PHP to deliver dynamic page content and to harvest information submitted via online forms. 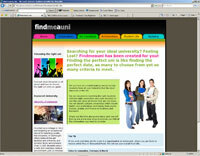 PHP/MySQL driven site allowing geographic or text based searches of archaeological courses, contacts, events and fieldwork. Commissioned by the Council for British Archaeology on behalf of the Archaeological Training Forum. PHP/MySQL driven site for a local human bone specialist, delivering online reports and details of services offered. Designed according to XHTML 1.0 Strict schema. Council for British Archaeology (CBA) Community Archaeology Forum. An interactive section of the CBA web site has recently been launched to allow community archaeology groups to publicise their findings and engage in discussion. This employs a 'wiki' engine using PHP and MySQL to allow users to upload their own material and comment on other projects. The engine chosen for this project was WikkaWiki, an Open Source Wiki engine available from wikkawiki.org, which has been comprehensively adapted to suit the needs of the CBA. The site was voted Best Archaeological ICT Project Award in the 2008 British Archaeological Awards, and was given an Innovation in the Community Award in 2007. Now archived on archaeoscope server, paypal etc disabled. Web site of the Northern Education Consultancy, based in Northern Ireland, dedicated to matching newly qualified teachers from Ireland with job opportunities in England, Scotland & The Isle of Man. This site uses two MySQL online databases, one to house details of job vacancies and a second to house details submitted by teachers / students looking for a job. PHP is used to transmit the data to the various pages and to allow an online search function. The jobs database is updated weekly using phpMyAdmin to reflect changes in vacancies in various local education authorities and schools subscribing to the site. 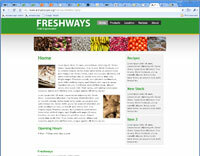 Florists web site employing HTML and PHP to allow easy updating of images on the site by the client. Images are simply uploaded to the relevant server directory, and PHP automatically delivers thumbnails and full sized images to the relevant page. A large site comprising thousands of individual web pages, designed to provide details of the work carried out by various organisations working for Mike Griffiths & Associates, a York based archaeological consultancy. Since its inception the site has grown dramatically, and is currently being overhauled to allow more dynamic content retrieval. Recent additions include the APC Chronicle section based on the WordPress Open Source blog engine. Blue Bridge Lane & Fishergate House. Archaeological monograph (part of the Archaeological Planning Consultancy site) publishing the results of recent archaeological work undertaken by Field Archaeology Specialists Ltd in Fishergate, York. Find Me A Uni (in preparation). Currently in preparation, this site is designed to help prospective students, primarily those in Ireland, to find university courses in the UK. Again, this is a database driven site using PHP and MySQL.